You can use your fingertips to blend in the concealer, but you should never rub. Constant rubbing pulls and damages this thin area of skin. The next step is to apply a base to help hold the eye shadow in place. Older women should use light shimmering colors, never dark ones. Apply just a touch of the lightest shadow to the area between your nose and the corner of your eye. This helps to get rid of shadows that make you look older. Use mascara only on the upper eyelashes. You can use a brush to define the lower ones if necessary, but you do not want dark mascara on your lower lashes. Be sure that your brows are well-groomed. Use a light colored pencil, not a dark one. Remember that the key to a more youthful look for older women is to always use light glowing colors. 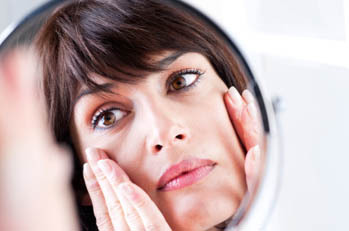 There is a tendency to try and cover wrinkles by using thick heavy foundation and powder. That doesn’t work. It actually highlights the wrinkled area. You want to choose a foundation that is very close to your natural skin color and apply a very thin layer. You can use your concealer to hide age spots and other dark areas. When it comes to makeup as we age, less is better. If you try to cover wrinkles with a thick layer of makeup, it will end up getting stuck in the crease created by the wrinkle. Here is the first reason that a good facial moisturizer is so important. There are ingredients that will help to keep your makeup from creasing. Others will help to bend the light, so that a wrinkle appears less deep. These ingredients can also help to reduce wrinkle depth with continued use. Grape seed oil, for example, dries to a light film that keeps make-up smooth. The protein keratin will help to cover wrinkles by bending the light and it will work to reduce wrinkle depth if you use it on a daily basis. The antioxidant coenzyme Q10 is another good choice. In several studies, it has been shown to significantly reduce wrinkling after three months of use. Apply the moisturizer first and allow it to dry for at least a minute, before applying your makeup. Use a good brand of makeup, ideally one that contains zinc oxide to protect against UVA light. Most cosmetics provide protection only against UVB. You can also use an eye contour gel to help reduce bags and dark circles. While the current goal is to cover wrinkles, your future goal should be to reduce their depth by protecting your skin. Learn more about how to do that.